Bargin Briana has a great list of of coupon matchups with whats on sale for Meijer this week! Victoria's Secret offers 3 Sweaters for $30 when you enter code 3FOR30 at checkout. They also have a 20% off code vssave20 which may be combined with the above code as well as code scarf09 for a Free Scarf. Shipping is $6.99. Just a reminder that the 50 FREE photo cards from Seehere.com expire TOMORROW November 30th. Use code newbaby and all you pay is tax, shipped directly to you. You can find more info further down my blog about this great offer! 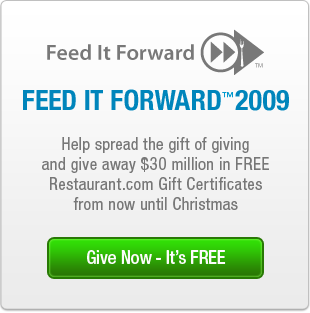 Restaurant.com’s Feed It Forward program is back. I loved this idea last year, and I sent a few family members free meals, which they appreciated. The gift of giving lifts spirits, spreads joy, and strengthens communities. Feed It Forward™ provides you the opportunity to help give away up to $30 million in free restaurant gift certificates—over 30 days—and allows you to treat friends, family, and colleagues—anyone deserving—to savings on a great meal out. Best of all, it’s FREE to Give and FREE to Receive. Through Feed It Forward™, you have the opportunity to give from the heart and enrich the lives of people around you through the gift of meals and memories. Give a free $10 Restaurant.com Gift Certificate to 30 different people, everyday until Christmas. Simply choose whom to give to and we take care of the rest. Give to family. Give to friends. Give to neighbors. Give to anyone who has touched your life, but most of all, give! Thank you for helping to Feed It Forward™. The only restrictions are you can send one gift per email address, and the $10 certificate typically requires a minimum purchase at select restaurants. Still, it would make for a frugal date night or a cheap lunch for a friend or loved one. Just in case you are interested in what coupons inserts are going to appear in this Sunday's paper, it looks like we can expect 1 P&G insert. $.25/3 Puffs Singles, or 3pk. $3 off Pur Pitcher or Faucet Mount Replacement Filter Multi-Pack or Refrigerator Filter, 1pk. $7 off Crest Whitestrips Advanced Seal 14ct. If you prefer to print your coupons off of the web, be sure to check out Coupons.com, RedPlum.com and Smartsource.com. It's the first of the month which means it is the best time to print coupons off of the web! Seems like the competition to get your business for online photographs is really heating up this season! Which we benefit from! Sorry for posting this so late in the day. As long as Walgreens receives your submission by midnight, you don't have to pick up instore for a few days if needed. Sorry for the lack of posts. I still have the flu. There are some really great deals this week online at Family Christian Stores. 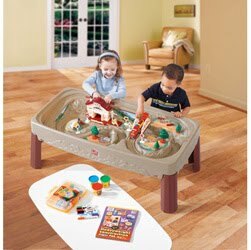 With shipping always only $0.99, I am happy to shop from the comfort of home! These deals are only valid through November 25th, so order today for these great prices! 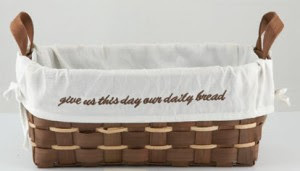 Click on the $5 “Doorbusters” banner on the home page to see the selection. This is something you are going to want to sign up for with all the great holiday deals coming up. Amazon is offering a FREE month of Amazon Prime in which you receive unlimited 2 day shipping, no minimum order size. Register for your FREE month of Amazon Prime. Enter your payment information to continue membership once trial is over. Make sure when you check out it states you are getting a FREE trial or you will be charged for membership. Next, go to Your Account, Settings, Manage Prime Membership. Select “Do Not Auto Upgrade” so you will not be charged when your trial is over! Unless you want to keep it! 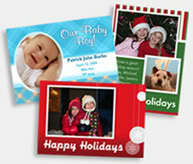 You can score 100 FREE Custom Photo Cards, with envelopes- perfect for Christmas! If you are not planning to mail out Christmas cards this year, you could repurpose them as gift tags, or even birth announcements. ■Be sure to save your card once you create it. Then put 50 photo cards in your cart and checkout using coupon code newbaby. You’ll get all 50 free with free shipping! THIS OFFER ENDS NOVEMBER 30. ■Next, log back in, click on your saved items and order another 50 photo cards, this time using the coupon code freebies4mom-1109(type in the code). Again, you should get 50 more free photo cards with free shipping. This offer ends November 21th TODAY, so don’t delay. Your cards should arrive via FedEx within 3 business days. If you are new to See Here, you will also receive 100 FREE 4×6 prints using the coupon code prints (but you need to order those 100 free prints separately from the photo cards). Buy 1, get a $3.00 Catalina valid on your next order. 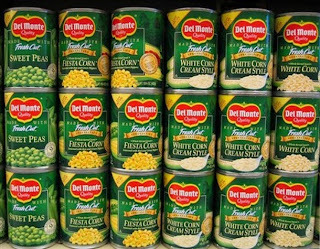 Target: Del Monte Veggies 20 cents a can! 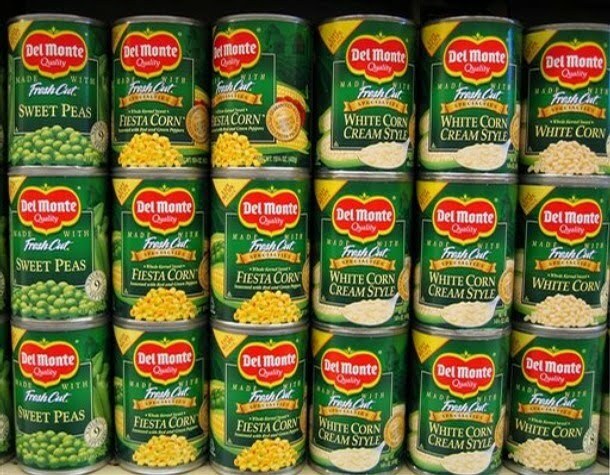 Time to fill your pantry! Meijer had a deal like this a while ago, but at 20 cents a can, its worth stocking up! Find great discounts on your favorite Disney kids Apparel at Disney Outlet – the official Disney Store online! Right now, you can get some great graphic t-shirts for only $2.99 (reg $9.50), PJ’s from $5.99 (reg $16.50) and action figures from $7.99 (reg $14.95)! If you have a Disney loving child, these would all make great stocking stuffers and gifts! Wowza!!! Yet another great Facebook freebie! Just click the link below and become a fan of Philosophy on Facebook. After becoming a fan, click on go to application (under the gingerbread on the left hand side), then you’ll need to click on the “Allow” button. 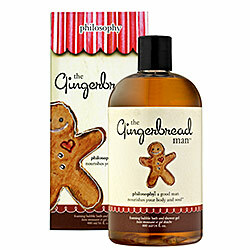 You’ll be taken to the page where you can fill out a form to claim a FREE sample of Philosophy The Gingerbread Man Foaming Shower Gel and Bubble Bath! Enjoy! Vivemejor is offering 4 samples. 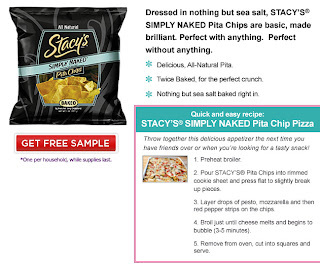 It’s a little unclear as to if it is only 1 free sample per item per household or just one free item. (These do come and are usually larger sizes). I love freebies and samples. Its so fun to get little surprises in your mail. Currently, I have a basket in my linen closet that holds all of of toiletry freebies and its packed! We use them for travel, camping and guests. From time to time I weed it out and give it away. Today I received 2 full size Matrix hair products and a few weeks ago 2 tickets to the Detroit Lions. We've even received Cuisinart saute pans! Its so fun to find a surprise sitting in your mailbox! 1. ALWAYS use an alternative email address. Most will want to put you on their mailing list unless you request not to during the sign up process. 2. NEVER give out your home phone number or any personal information. I have no problem giving out my address, but don't give out my phone number or real birth date. It costs money for companies to mail you something so rarely, if ever, will you receive solicitations in the mail because of requesting freebies. They are more likely to call. 3. Be quick! Most samples are only available to a certain number of requests. 4. Be patient. It typically takes 4-8 weeks for something to arrive. Some things you sign up for, never will come. But most do if its a reputable company. 5. 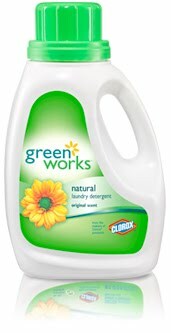 Walmart.com has an ongoing list of freebie items and they always come quickly. They never email and change their offers frequently. 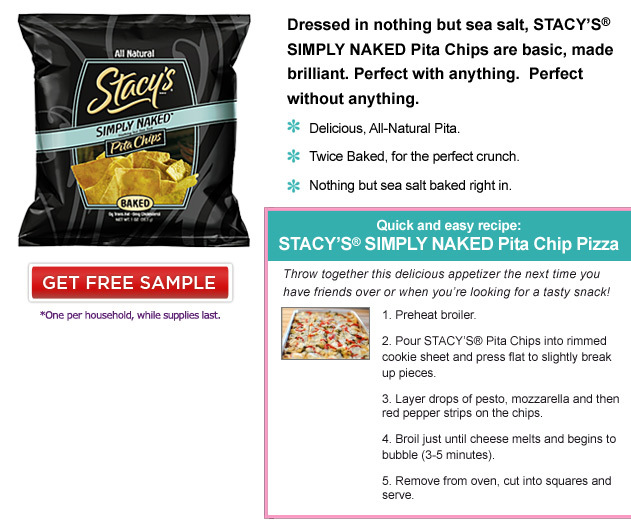 Simply go to walmart.com and click on in stores now and then free samples. Keep checking out this blog for sample and freebie listings! 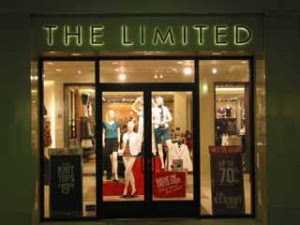 The Limited has a printable coupon for $15 off a $30 purchase, $30 off $100 or $50 off $150. This coupon will expire on November 23. Use coupon code CH15OFF at Chadwick’s and get $15 off your $15 or more purchase! The code expires 11/23/09, but it could possibly happen sooner depending on how many orders they get. Shipping is $6.99 for up to a $19 purchase. So for $6.99, you could possibly get one or two nice things! There are some nice things in the clearance section starting at $5.99, so be sure to look there. 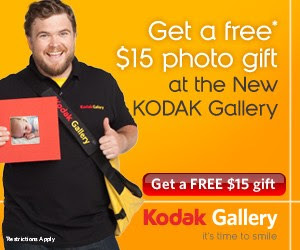 Kodak Gallery is offering a $15 gift code to the first 100,000 customers to help celebrate their redesigned website. Catch up on printing your pics or order a fun photo gift such as a mug or a photo book. Shipping charges apply. SeeHere.com is offering a free red or white tree photo ornaments with coupon code mallornament. Shipping is also free. Hopefully this comes! As more and more people do this deal they may cancel the orders. Fingers crossed. As of 4:45pm Sunday they were still accepting orders. Use code WW32600 for FREE ground shipping with any purchase. You total will come to just $2! Please note that this sale may only be good for a short time! So hurry to get this amazing deal! Have you signed up for Vocal Point? You should! Its free to join and as a member they send you free trials or full size products to try and then review online if you want to. They also send out high value coupons. This site is similar to Bzzagent. I signed up a few months ago and so far received Secret Clinical Strength Deodorant and a brochure of Kashi Go Lean cereal coupons. The coupons made the cereal free. UPDATE: You can use the $1 off Up and Up Target wipes coupon on the toddler wipes as well. 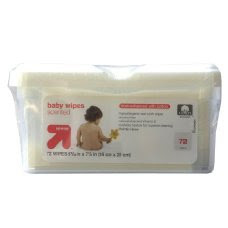 Toddler wipes run $.97 per package, making them free. Newest update 11/14/09: Target must of caught on. The toddler wipes are now $1.99 per package at the Jenison Target. Ugh. 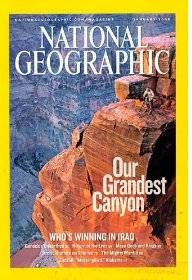 Amazon has a deal going on right now where you can get a one year subscription to National Geographic for $10-thats 83 cents an issue. Its listed as $15, but the $5 will come off a check out. Regular price $71. Great gift idea! 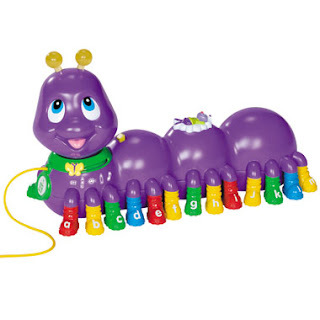 From 11/13-11/14 Toys R’ Us has the LeapFrog Alphabet Pal for only $10.49. Grab the ad(it was in the Advance Newspaper this week) and take it into Target to price-match. I've never priced matched before so I'm going to give this a try! Hopefully this works! 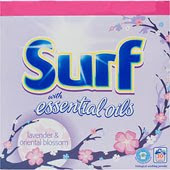 Just share your best tip for getting rid of stains here and you’ll get a free sample of Surf with Essential Oils. Buy 2 Large Jar Candles and get 2 more for FREE with this printable coupon, good until November 29. 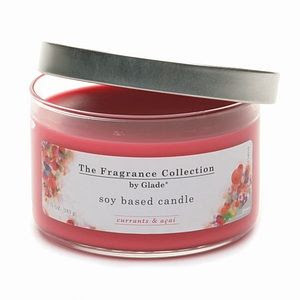 Glade is again offering a $3.50 off coupon on any candle product. These are usually priced around $3 at most stores, so they would be free with the coupon. 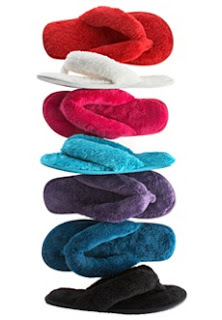 What a great little stocking stuffer, or nice addition to a gift baskets. Hurry and print your coupon because the print limit is always reached quickly. Gosh I love getting gift cards when writing reviews! With Christmas coming up, this couldn't come at a better time. 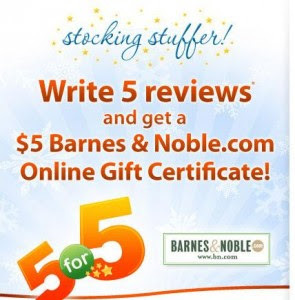 Viewpoint is offering a $5 gc to Barnes and Noble for writing 5 reviews of products. Each review must be 900 characters and must be received by Nov 15 or from the first 10,000 qualified entries. Its quick and easy to do! Sign up below and make sure to check out the official rules for detailed information. Thanks Frual in Virgina for the info! Meijer has a $5 off Purina One coupon. Pair it with the $2 manufacturer coupon from 10/18 SS and you can get cat or dog food pretty cheap. Currently the 3.3lb of Purina One cat food is $7.39, so $.39 for cat food! You can use it on dog food as well! Hurry! The manufacturer coupons expires 11/18. Great donation for the Humane Society! Sign-up for The Big Idea Newsletter and you’ll get a FREE Veggie Tales DVD–just pay $2.99 for shipping. Big Idea is the company that produces Veggie Tales and other faith based products. Walgreens has a great deal going on this week where you end up getting Huggies Jumbo Packs for $4.25 each. I haven't personally tried the deal but other bloggers are confirming it. It was a great week at Target as well as Family Fare with coupon doubling. Everything to the left of the Gillette shave is free. Everything to the right of the shave cream was under $.80 each. The most expensive item with the Dishwasher Rinse aid for $.80. What were some of your "scores" this week? What are you looking forward to next week? Celebration Cinema North(Grand Rapids, MI) will be Celebrating the Classics-Holiday Series 2009! 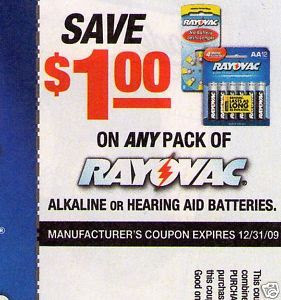 While checking out the Dollar Spot at Target this week, I saw packs of AA and AAA and C Rayovac Batteries. Pair this with the $1.00 coupon from 10/18 SS and get them free! Have a son or daughter in college? Sign up as a fan on our Facebook page and we'll send a FREE college care package to your favorite student. Please fan our page to qualify for the FREE college care package. One entry per Facebook account, please. Limited to the first 3,000 participants. Offer expires November 25, 2009 or while quantities last. Free Movie ticket when you buy 2 General Mills cereals. -Buy two specially marked General Mills cereals that say "free movie ticket" on the front. It should be on 17 oz boxes. -Print out your ticket and take with you. **Tickets are good up to $12. Online codes have to be entered by June 30, 2010. Tickets expire 60 days from the date they are issued. 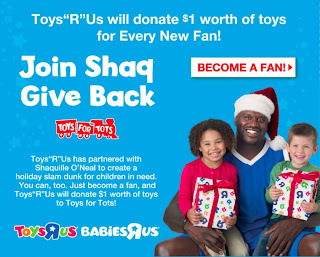 Toys R Us will donate $1 to the Toys for Tots Program for every person who becomes a fan on Facebook! Target has great deals this week-as usual. Check out what other bloggers came up with as good deals for this week. I'll be running back to Target tomorrow!!!! KIRKLAND Signature™ Supreme Diaper samples are only available on Costco.com. You may purchase KIRKLAND Signature™ Supreme Diapers at your local Costco Warehouse for a cash and carry price, or on Costco.com. Rick Warren has released his newest book-The Purpose of Christmas. Limited to the first 5000 requests. Wow! They are doubling coupons Nov 1-3 up to $1. Since no stores in the Grand Rapids area do this, its a nice way to get freebies! Check out One Frugal Mama for a complete list of coupon matchups. It looks like you can get free toothpaste, shave gel, $15 worth of Smuckers brands for $.88 and lots of other goodies! Recyle your old Christmas string lights and receive $3 off when you purchase LED Christmas lights at the Home Depot. This promotion runs Nov 5-15. The price of these run $5.97, so $2.97 after the trade in. You can return up to 5 strands per customer. YMMV on using 4 Target coupons, you maybe only able to use 3.